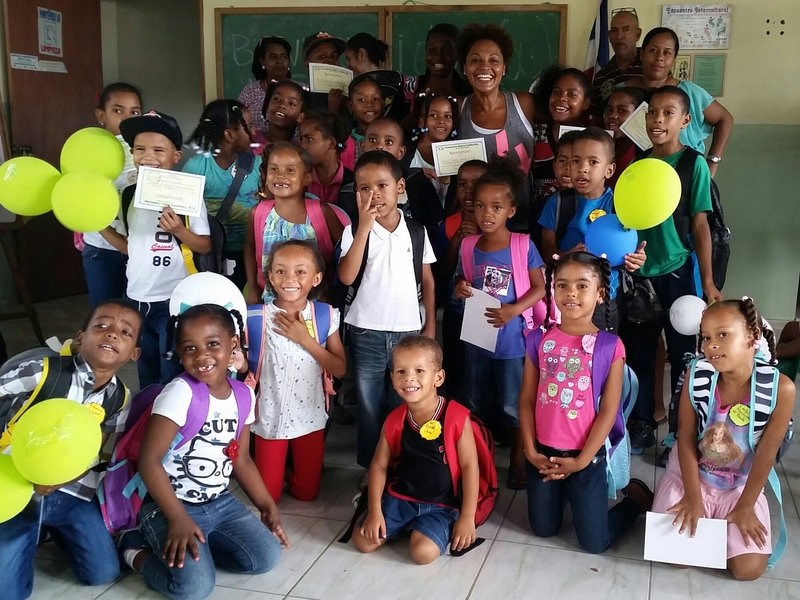 Three years ago, I made the commitment to help poor children in ”Los tres Brazos”, one of the most impoverished communities in the Dominican Republic capital city, go back to school with school supplies and backpacks. For the past 3 summers, I have collected and shipped donations from my own school community, colleagues at Mayer Magnet School, family and friends. I have been amazed by their generosity in helping me ship boxes full of school supplies and backpacks for many high-needs children. Today my mission was accomplished! I have a passion for education and so it means the world to have finally provide children, who are less fortunate, the opportunity to begin their academic year with a new backpacks and school supplies, that other wise their families would have not been able to provide. I can’t begin to explain my gratitude to everyone that helped me make this vision a reality. I will forever be grateful. To be present and witness the children’s smiles and excitement was priceless. It was summer 2012, during one of my visits to “Los Tres Brazos”, one of the most impoverished communities in the city of Santo Domingo, Dominican Republic. For many, it may not seem like the most pleasant place to be – compared to all the beautiful tourist sites in Dominican Republic. However, to me it’s a home away from home. School had already started and while sitting in the front steps of my grandmother’s house, I asked my cousin why there were children hanging out in the streets rather than being in school. He mentioned to me that many poor families don’t have enough resources to send children with backpacks and school supplies so they’d rather not send them until they gather the money. Being a teacher, I knew I had to do something! I looked at how fortunate I was to have had the opportunities in the US. I saw myself in those kids and it broke my heart because I knew I could have been one of them. At that moment, this journey of giving back began. I love inspiring stories like this. Kudos for doing that. I have worked in impoverished areas in Brazil, Kenya and Burkina Faso. In the last country, I planned to set up a project to support girls’ education but once I was back to the UK I got scared by the enormity of the project. Your story made me realise that those personal projects to support others are feasible, even if it takes years and many sacrifices. Thanks for sharing.